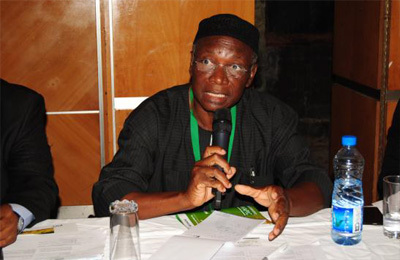 In preparations for the MAN Expo 2016 billed for March 15-17, 2016, in Lagos, Reginald I. Odiah, Chairman, Economic Policy Committee (EPC) of Manufacturers’ Association of Nigeria (MAN), has said that his vision is to see the Nigerian manufacturing sector developing and achieving a GDP (Gross Domestic Product) growth of 5% per annum for the next four years. In connection with the forthcoming MAN Expo, the statement said that thousands of Nigeria’s leading manufacturing experts would meet for the third annual mPAD& inaugural Nigeria Manufacturing Expo (MAN Expo) in Lagos, in response to the government’s commitment to industrialisation and Nigeria’s need to diversify. The event, according to statement, is enjoying important industry support, including the Manufacturers’ Association of Nigeria (MAN) which is Event Patron, the Federal Ministry of Industry, Trade and Investment of Nigeria are Host Ministry and the Lagos Chamber of Commerce and Industry are the Host Chamber respectively. Therefore, MAN’sOdiah invites Nigerians to attend the event and “to be ready to participate in it because the Expo is going to be exciting with great opportunities for business-to-business discussions, purchase the latest production machines and equipment, development of joint ventures between companies and technology transfers. dozens of leading international manufacturing equipment suppliers, who have already signed up for what is regarded as a long overdue gathering of the manufacturing industry. Top manufacturing suppliers including Festo Automation, Miele Packaging, Bühler, Thompson & Grace, Gil Automation, Mazzoni LB SpA, Zutrad Ventures Limited, Kautex Maschinenbau GmbH and the National Automotive Design and Development Council will be among many others exhibiting their machines, tools, automation technology and services at the Nigeria Manufacturing Expo. “Nigeria is and will become the strongest economy on the African continent” says Adrian Naidoo, Bühler’s Country Manager for Nigeria – the company is a global specialist in plant and equipment and related services for processing foods and manufacturing. There are scores of other leading local manufacturers, including Cadbury Nigeria, Flour Mills of Nigeria, Frigoglass Industries Nigeria, Guinness Nigeria, A.G. Leventis, Mokolade Pharmaceutical, Mopson Pharmaceutical, Nampak, Nestle Nigeria, Procter & Gamble, British American Tobacco, May & Baker Nigeria and many more have already confirmed to be among the 2000+ visitors at the MAN Expo to evaluate and purchase machine tools, manufacturing machinery, automation technology, assembly and handling automation systems, laser coding systems, IT software as well as validation and calibration services. The third annual mPAD (Manufacturing Partnerships for African Development) will gather expert speakers from the industry. They are expected to thrash out such topics as “A new dawn for the Nigerian manufacturing sector – reform update and the way forward; Increasing productivity through industrial clustering; Synchronizing value and supply chains & technical workforce training;Nigerian Industrial Revolution Plan (NIRP):Setting the wheels in motion; Factory financing mechanisms: What is holding industrialization back? ; and ECOWAS trading zone & global trading agreements. The upcoming Nigeria Manufacturing Expo is MAN’s official trade expo, being hosted in partnership with Spintelligent Pty and Clarion Events Limited, African event specialists and organisers of the West African Power Industry Convention (WAPIC).